HAPPY BIRTHDAY ONE YEAR ANNIVERSARY. 1SH ORIGINAL MOVIE POSTER 1978. We sell more vintage original STAR WARS posters than anyone in the galaxy! To view our entire STAR WARS inventory. If it has any minor defects like pin holes, creases, etc. And they are not mentioned above, they should be visible in the high resolution photo. WE DO NOT SELL REPRODUCTIONS OF ANY KIND. Perfect for a high end home theater. Highly sought after by movie poster collectors and aficionados. Get notified of our AUCTIONS & NEW INVENTORY instantly! This is what all you STAR WARS fans have been waiting for! This is a genuine 27" x 41" U. One sheet ORIGINAL MOVIE POSTER issued by the studio when the film was released and meant for theatrical display. One of the RAREST original Star Wars movie posters. The initial theatrical release of Star Wars was so popular that some theaters were still playing it a year after it first came out in 1978! This poster was issued to those few theaters. According to long time Star Wars poster experts it is rumored that there were only 250-500 printed, although no one can absolutely positively confirm this. These can be very difficult to find in any condition! A long time can go by without one of these coming up for sale. You will have trouble finding a nicer one. Some very light wrinkles throughout. Minor foxing/brown spotting on bottom border. No tears, no tape, no pin holes. If a vintage poster is in terrific unrestored condition like this one (EX C8 or better), many experienced collectors will place a premium on it (when compared to a linen backed/restored one). Most experienced collectors prefer unrestored items to restored ones because they believe they will appreciate more in value. This poster is considered to be within that class and is definitely INVESTMENT QUALITY. A perfect candidate for Linen Backing, although it is not necessary as this poster displays beautifully as is. If you want this poster to appear as near perfect as possible with no fold lines and any imperfections fixed, you may want to get it linen backed. This is NOT a reprint or reproduction poster! We guarantee that all posters we sell are graded and described accurately. Unless otherwise specified in the description, ALL POSTERS ARE ORIGINAL MOVIE POSTERS original theatrical movie posters that were displayed or meant for display (unused) in theaters at the time the movies were released. We will put in writing that we guarantee it to be an Original Movie Poster. 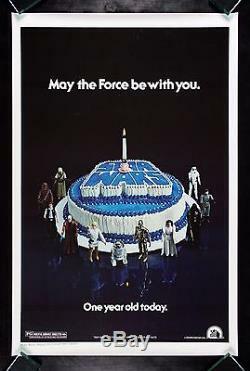 The item "STAR WARS CineMasterpieces 1978 RARE HAPPY BIRTHDAY 1SH ORIGINAL MOVIE POSTER" is in sale since Saturday, October 22, 2016. This item is in the category "Entertainment Memorabilia\Movie Memorabilia\Posters\Originals-United States\1970-79".